Dr. Feigenberg is an Associate Professor/Director of Clinical Research, Department of Radiation Oncology; Dr. Campassi is an Assistant Professor, Department of Radiology; Dr. Sharma is an Assistant Professor, Department of Radiation Oncology, University of Maryland School of Medicine; Dr. Kesmodel is an Assistant Professor of Surgery, Division of Surgical Oncology, Department of Surgery, Department of Surgical Oncology; and Dr. Tkaczuk is a Professor and Director of the Breast Evaluation and Treatment Program, Department of Medical Oncology, University of Maryland School of Medicine, Baltimore, MD. Dr. Yu is the Chief of Nuclear Medicine/PET, and Associate Professor of Diagnostic Imaging, Fox Chase Cancer Center, Philadelphia, PA.
A multidisciplinary approach to cancer diagnosis and treatment is vital to optimize care for the cancer patient. Multidisciplinary cancer management requires coordination among many different specialities involved in cancer care of an individual patient. Participants in this care include physicians from diverse oncology specialties, including surgical oncology, medical oncology, radiation oncology, pathology, radiology, nuclear medicine, genetic counseling, and depending on the tumor type, may also include various others from internal medicine and palliative care. In addition to physicians, there are nurses, nurse practitioners, physician assistants, and oncological nurse specialists that are involved in care, including patient navigators, clinic and research coordinators, and data managers as well as patient advocates and social workers. Ten years ago, there was no published prospective literature on ablative doses of radiation therapy for lung cancer (see below). Therefore, 2 of the authors of the current manuscript, Drs. Feigenberg and Yu, developed and opened a phase I dose escalation study10 testing this novel technique, which had previously been successful in the management of inoperable brain tumors. As part of this study, the use of fluoro-deoxyglucose (FDG) positron emission tomography (PET)/computed tomography (CT) was incorporated into the treatment paradigm for patients with curable disease, with the specific purpose to use PET as a potential early biomarker for treatment response similar to what others had published in the setting of locally advanced disease.11 As is often the case in phase I studies, this patient’s situation created a clinical dilemma. As this was a medically operable patient, it was vital to review her images to determine further management. Her case was presented in conference, and it became glaringly obvious that the imaging findings were not as suspicious as the report indicated. 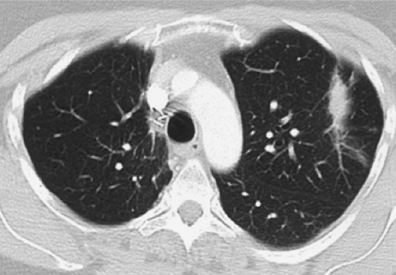 Figure 1 demonstrates CT lung windows and the corresponding FDG PET prior to and 3 months’ post-SBRT. Radiographic changes appeared as patchy consolidation with some surrounding ground-glass opacities as opposed to a solid mass-like lesion. Dr. Feigenberg discussed the “new” treatment technique with his colleagues and demonstrated the differences in how the radiation dose could be delivered using many unique nonopposing coplanar and noncoplanar beams (Figure 2). This approach can cause a difference in the appearance of radiation pneumonitis that will more precisely conform to the tumor and will not have straight edges, typically seen using 2 opposing beams as was the standard approach. 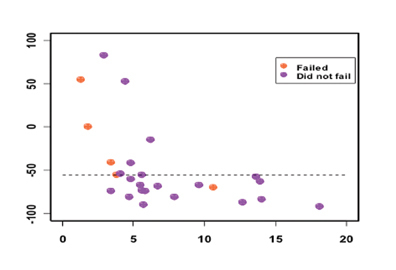 Based on this factor, it was believed this abnormal PET finding was caused by an asymptomatic pneumonitis. It was recommended that surveillance be continued as opposed to any further intervention. Over time, the radiographically abnormal region became linear and denser, stretching in the direction of the radiation dose fall-off. This dense consolidation has remained stable for 5 years (Figure 2). This initial interaction led to several meaningful peer-reviewed presentations10, 12, 13 and publications describing the importance of pre-SBRT PET values, post-SBRT PET values, and changes in PET values over the course of therapy (Figure 3). These findings are critical as this novel therapeutic radiation approach is currently challenging the paradigm of surgery14 as standard of care for early stage lung cancer. This was the first data to illuminate concern of false positive results caused by radiation pneumonitis as well as the predictive value of a drop of the maximum SUV of 50%, required to ensure long-term local control. Our multidisciplinary (multiD) Breast Cancer (BC) conference is held weekly before the multidisciplinary clinic and includes participants from all specialties involved in management. All newly diagnosed BC cases are presented, and pathology and imaging findings are discussed initially followed by preliminary workup and treatment recommendations. Patients are then seen on the same day in the multidisciplinary clinic held immediately after the conference by the 3 primary cancer specialists—surgical oncology, medical oncology, and radiation oncology. The recommendations are then made same day; the benefit of seeing newly diagnosed BC patients on the same day of the multiD conference is that the team can rapidly implement recommendations for further work-up if deemed necessary. In addition, the group can still consider the case or review the medical history and clinical findings given mutual accessibility at the same location. The additional benefit to the patients is that they are seen by the 3 primary cancer specialists on one day and do not have to make several trips to be reevaluated. Often patients are not aware that the management of BC may require treatments after surgery with radiation to the breast, hormonal therapy, and/or chemotherapy. These basic concepts of management of early-stage BC can also be introduced to the patients during their first visit to the multiD clinic. The following case demonstrates many interactions between disciplines that are vital to patient care. 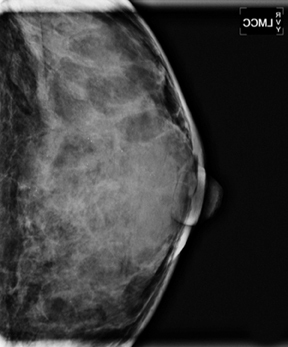 A 40-year-old woman, with no known risk factors for breast cancer, presented for a baseline mammogram. 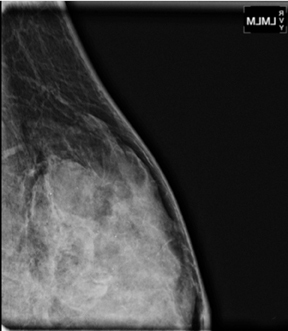 This mammogram showed dense breasts with bilateral scattered and grouped calcifications with an asymmetric distribution, more numerous in the upper outer quadrant (Figure 5). The test was interpreted as incomplete, requiring additional evaluation with dedicated magnification views. 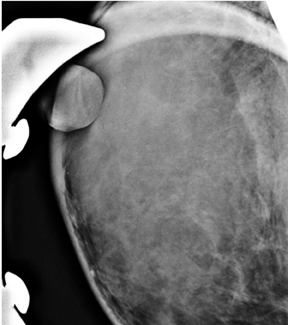 When the patient returned for the additional diagnostic work-up, the morphology of the left breast calcifications was found to be suspicious, while the right breast calcifications were categorized as probably benign (Figure 6). Of note was that the breast thickness under mammographic compression was only 2.5 cm, usually a limiting factor to performing a needle biopsy under stereotactic guidance. The radiologist informed the patient of the results and need for biopsy. The patient was referred to the multidisciplinary breast clinic for further evaluation and discussion of treatment options. Her case was presented to the multidisciplinary panel (breast imaging, breast surgery, medical oncology, radiation oncology, and breast pathology). Based on the imaging findings, the options of stereotactic-guided core and excisional biopsy were discussed. The patient elected to undergo a stereotactic-guided approach with the pathology demonstrating extensive atypical ductal hyperplasia. The case was discussed again in the multidisciplinary conference. Due to the presence of extremely dense breast tissue,15, 16 an independent risk factor for breast cancer on mammogram, the patient’s young age, and the newly diagnosed high-risk lesion, a breast MRI with gadolinium was recommended. 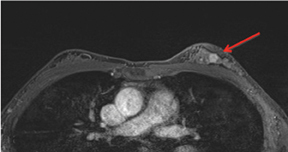 MRI demonstrated a 1-cm highly suspicious spiculated mass at the 12 o’clock position of the left breast and markedly asymmetric background parenchymal enhancement of the left breast compared to the right. 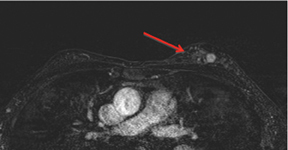 Additionally, a nonspecific 1-cm left axillary node was also noted on MRI (Figure 7). 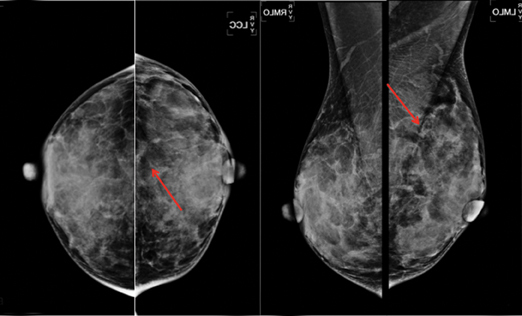 The breast MRI was interpreted as suspicious. 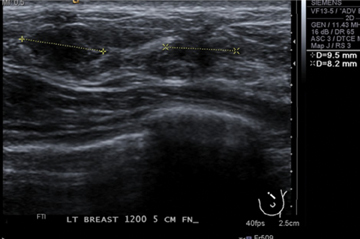 An ultrasound of the breast and the axilla confirmed the presence of 2 breast tissue abnormalities at 12 o’clock, believed to be highly suspicious for malignancy (Figure 8). 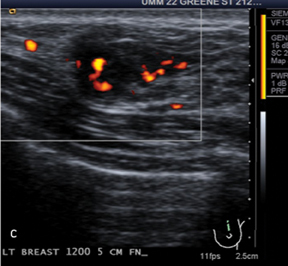 The axillary node had a nonspecific appearance on ultrasound. 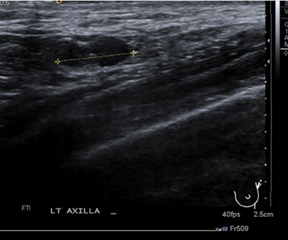 The patient underwent biopsy of both masses and an ultrasound-guided fine-needle aspiration of the left axillary node. The larger 9-mm mass was an invasive ductal carcinoma, the smaller 8-mm mass was ductal carcinoma in situ, and the lymph node was positive for metastasis. 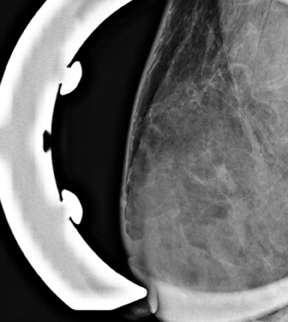 The patient was brought back to the multidisciplinary conference for a third time, where it was determined that the patient was not a good candidate for breast conservation due to the small size of her breast and a challenge for follow up due to diffuse calcifications and multifocal disease. Further discussion of the literature ensued regarding the possible need for radiotherapy and the role of a lymph node dissection.17, 18 Delayed breast reconstruction19, 20 was recommended to decrease the risks of loss of the implant due to encapsulation as compared to patients who undergo immediate reconstruction. Lastly, the role of axillary dissection was discussed. The recently conducted MRI evaluated the role of axillary dissection following positive sentinel lymph node biopsy17. The data were convincing that outcomes are not compromised by withholding dissection, although patients received radiotherapy to the whole breast, which indirectly also treats the majority of the axilla. 21, 22 In this case, since the patient was not going to receive radiotherapy following her mastectomy, an axillary dissection was recommended. 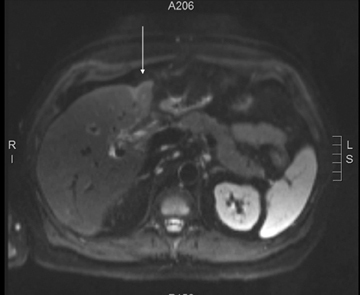 This case illustrates another example of how multiple disciplines were able to work together to convert an “incurable patient” to a “potentially curable patient.” Orthotopic liver transplant (OLT)23 is the only realistic curative treatment for patients with chronic hepatitis who are found to have hepatocellular carcinoma (HCC). The patient underwent CT-guided IRE on 3/22/2011 and tolerated his treatment well. Subsequently, the patient underwent 4-dimensional simulation (to account for tumor movement with the respiratory cycle) and a 5-fraction treatment of 6 Gy each was delivered to a large portion of the left lobe. The total dose of 30 Gy was administered over a 9-day period ending on 4/20/11, also tolerated well by the patient. A repeat MRI on 5/16/2011 demonstrated interval atrophy of the left lobe (Figure 9) with no residual enhancement and consistent with tumor regression/resolution. AFP levels (measured in ng/ml) continued to drop to 390.8 on 5/2/11, 44.7 on 5/26/11, 6.6 on 6/22/11, and 4.8 on 8/8/11 (Figure 10). Restaging PET and bone scans along with subsequent MRI studies continued to demonstrate no further abnormal activity compatible with disease recurrence. The patient was again presented to the multidisciplinary hepatobiliary tumor board in September. 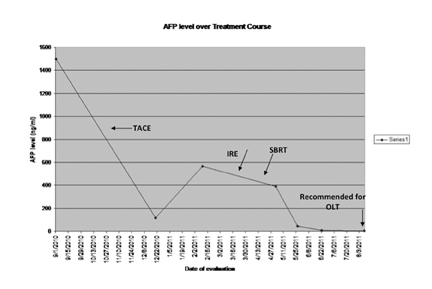 Given the dramatic decline in AFP levels without evidence of recurrent or metastatic HCC, the patient was reconsidered for OLT and was subsequently placed back on the active transplant list. Birchall M, Bailey D King P. Effect of process standards on survival of patients with head and neck cancer in the south and west of England. Br J Cancer. 2004;91:1477-1481. Junor EJ, Hole DJ, Gillis CR. Management of ovarian cancer: Referral to a multidisciplinary team matters. Br J Cancer. 1994;70:363-370. Davis S, Dahlberg S, Myers MH, et al. Hodgkin’s disease in the United States: A comparison of patient characteristics and survival in the Centralized Cancer Patient Data System and the Surveillance, Epidemiology, and End Results Program. J Natl Cancer Inst. 1987;78:471-478. Nyquist JG, Radecki SE, Gates JD, Abrahamson S. An educational intervention to improve hospital tumor conferences. J Cancer Educ. 1995;1:71-77. Nyquist JG, Gates JD, Radecki SE, Abrahamson S. Improving the educational process of cancer case conferences. Acad Med. 1992;67:S1-3. Nyquist JG, Gates JD, Radecki SE, Abrahamson S. Investigation into the educational process of cancer case conferences. Acad Med. 1990; 65:S35-36. Petty JK, Vetto JT. Beyond doughnuts: Tumor board recommendations influence patient care. J Cancer Educ. 2002;17:97-100. Macaskill EJ, Thrush S, Walker EM, Dixon JM. Surgeons’ views on multi-disciplinary breast meetings. Eur J Cancer. 2006;42:905-908. Cohen RJ, Sharma N K, Yu JQ, et al. A phase I radiation dose escalation trial of stereotactic body radiotherapy for malignant lung tumors. J Biomed Sci Eng. 2010;3:351-358. Hicks R J, Kalff V, MacManus MP, et al. The utility of (18)F-FDG PET for suspected recurrent non-small cell lung cancer after potentially curative therapy: Impact on management and prognostic stratification. J Nucl Med. 2001 42:1605-1613. Sharma NK, Ruth K, Konski AA, et al. 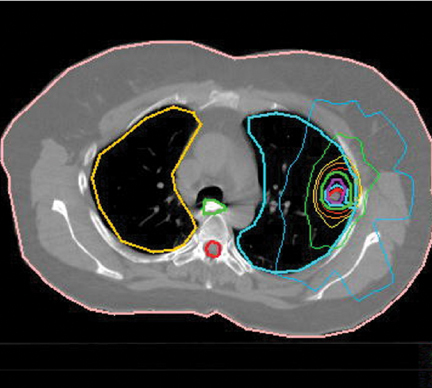 Low morbidity and excellent local control using image guided stereotactic body radiotherapy (IGSBRT) for lung tumors. Int J. Radiat Oncol Bio Phys. 2008;72:S454. Husain ZA, Sharma NK, Hanlon AL, et al. Low pretreatment PET SUV predicts for increased local failure following stereotactic body radiation therapy for lung cancer. Int J. Radiat Oncol Bio Phys. 2010;78:S525. Timmerman R D. Surgery versus stereotactic body radiation therapy for early-stage lung cancer: Who’s down for the count? J Clin Oncol. 2010;28:907-909. Sardanelli F, Giuseppetti GM, Panizza P, et al. Sensitivity of MRI versus mammography for detecting foci of multifocal, multicentric breast cancer in fatty and dense breasts using the whole-breast pathologic examination as a gold standard. AJR Am J Roentgenol. 2004;183:1149-1157. Biglia N, Bounous VE, Martincich L, et al. Role of MRI (magnetic resonance imaging) versus conventional imaging for breast cancer presurgical staging in young women or with dense breast. Eur J Surg Oncol. 2001;37:199-204. Giuliano AE, McCall L, Beitsch P, et al. Locoregional recurrence after sentinel lymph node dissection with or without axillary dissection in patients with sentinel lymph node metastases: The American College of Surgeons Oncology Group Z0011 randomized trial. Ann Surg. 2010;252: 426-432. D’Angelo-Donovan DD, Dickson-Witmer D, Petrelli NJ. 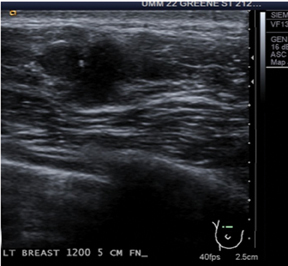 Sentinel lymph node biopsy in breast cancer: A history and current clinical recommendations. Surg Oncol. 2012 epub ahead of print. Lee BT, A Adesiyun T, Colakoglu S, et al. Postmastectomy radiation therapy and breast reconstruction: An analysis of complications and patient satisfaction. Ann Plast Surg. 2010; 64:679-683. Christante D, Pommier SJ, Diggs BS, et al. Using complications associated with postmastectomy radiation and immediate breast reconstruction to improve surgical decision making. Arch Surg. 2010;145:873-878. Haffy BG, Hunt KK, Harris JR, Bucholz TA. Positive sentinel nodes without axillary dissection: Implications for the radiation oncologist. J Clin Oncol. 2011;29:4479-4481. SchlembachPJ, Buchholz TA, Ross MI, et al. Relationship of the sentinel and axillary level I-II lymph nodes to tangential fields used in breast irradiation. Int J Radiat Oncol Biol Phys. 2001;51:671-678. Schwartz, M. E. Primary hepatocellular carcinoma: Transplant versus resection. Semin Liver Dis. 1994;14:135-139. Guo Y, Zhang Y, Klein R, et al. Irreversible electroporation therapy in the liver: Longitudinal efficacy studies in a rat model of hepatocellular carcinoma. Cancer Res. 2010; 70:1555-1563. Pech M, Janitzky A, Wendler JJ, et al. Irreversible electroporation of renal cell carcinoma: A first-in-man phase I clinical study. Cardiovasc Intervent Radiol. 2011;34:132-138. Lo SS, Dawson LA, Kim EY, et al. Stereotactic body radiation therapy for hepatocellular carcinoma. Discov Med. 2010;9:404-410. Tse RV, Hawkins M, Lockwood G, et al. Phase I study of individualized stereotactic body radiotherapy for hepatocellular carcinoma and intrahepatic cholangiocarcinoma. J Clin Oncol. 2008;26:657-664. Integration of modern imaging into the multidisciplinary setting: The radiation oncology perspective. Appl Radiol.